This article will give you a step-by-step process on how to import your manufacturer information. The Export/Import page will list a series of Export options on the left and Import functions on the right. Look towards the right hand side of the page (Import), and click on the +Icon next to the "Manufacturers" option. This action will download a CSV file named manufacturers.csv to your computer. Here's an example of what the spreadsheet will look like. Do not remove, add, or edit any columns to this file. If you do not have a need for a column please leave it blank. This is the exact format the file needs to be to import your Manufacturer information properly. This is the unique ID assigned to the manufacturer by the 3dCart system. If this is a fresh import, you will leave this column blank. This is the name of the Manufacturer the product is associated with. 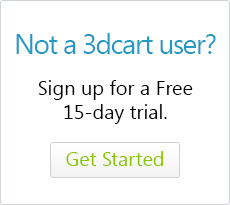 The list of Manufacturers can be located in the 3dcart Online Store Manager by going to Settings =>General =>Manufacturers. Any new manufacturers entered in the CSV file will be automatically created in the system. will display before higher numbers. Put 0 if you do not have a sorting preference. Look towards the right hand side of the page (Import), and click on the +Icon next to the "Manufacturers" option. The store will import you product manufacturer data and update the products accordingly.